We'll sweep the kitchen clean, my dear, and have a little song. Just give the mush a turn. Those words were written by Stephen Foster in 1850. Intended to be a love song, a modern listener can't help but note that Nelly is expected to do the chores while her husband sings. Fourteen years later, on May 5, 1864, Elizabeth Jane Cochran was born in Cochran's Mills, Pennsylvania. Yes, that's right—her parents basically owned the town. Her father was a judge, but when he died it was without a will; the estate was sold and Elizabeth's mother had to scramble to support the family, eventually marrying an abusive man to do it. This produced a budding feminist in Elizabeth, whose letter to the editor of the Pittsburgh Dispatch rebutting a sexist article she read got her a job as a journalist. 1882 was far from the world of Lois Lane. It was considered "unseemly" for a woman to use her private name in public. 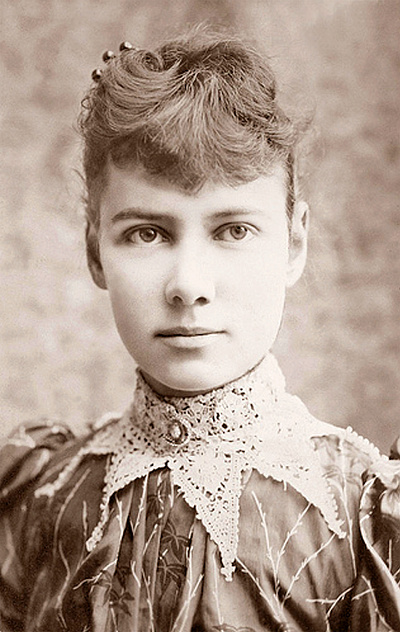 Elizabeth Cochran's editor chose "Nelly Bly" from the Steven Foster song. We don't know if Elizabeth took her cue from her namesake's broom, but she got busy cleaning up Pittsburgh by inventing investigative reporting. She went undercover and went to work at a sweatshop, revealing publicly the dreadful and dangerous working conditions and low pay. While the articles sold lots of newspapers (evidenced by the fact that circulation rose when they appeared), that didn't seem to hold as much sway with her editor as the fact that the sweatshop owners threatened to quit advertising if the articles didn't stop. Nelly/Elizabeth was promptly moved to the "fashion beat." We'd like to think that the media—newspapers in the 1800s, and TV today—are beacons of honesty, that their lights beam into the darkest corners and reveal all to anyone paying attention. Unfortunately, this is a myth (spread by the media, of course). Nelly Bly did her best, but it seemed whatever evil she revealed simply cost her a job. When she exposed poverty and political corruption in Mexico, the Mexican government extradited her and her newspaper fired her. Apparently, each paper that hired her thought they would be the ones who could keep her under control. Joseph Pulitzer's paper The New York World assigned her to be committed to the Women's Lunatic Asylum on Blackwell's Island. This was a dangerous assignment, since once committed, Elizabeth was a prisoner. However, the Asylum didn't advertise in the World so Nelly's job was secure. In the fall of 1888, the World got the idea of having a reporter duplicate the feat of Phineas Fogg in Jules Verne's Around The World In 80 Days. They, of course, assumed a man would do this. They assumed wrong. Elizabeth threatened to do it for another paper if the World didn't send her. So, in 1889, send her they did. By train, boat, and rickshaw Elizabeth not only traveled through England, Japan, China, Hong Kong, and others but also took time out to visit the home of Jules Verne himself—and she still managed to beat the fictional Fogg's record, by returning to New York on January 25, 1890, just a few hours over 72 days abroad. The fact that she had traveled around the world without being accompanied by a man was another record, and made her a role model for women everywhere. The World's circulation having gone through the roof due to her articles describing her travels, Elizabeth thought she deserved a bonus. The paper disagreed, and Elizabeth quit. In future years, however, and for different newspapers, Elizabeth covered a women's suffrage convention and World War I from Europe's eastern front. Today marks the 116th anniversary of Nelly Bly's triumphant, if financially unrewarding, return from her trip around the world. I imagine she would love living today, knowing that she could report whatever dirt her broom turned up—on the Internet—without fear of being fired as a result.